Come autumn, the land of India goes in a festive mood. The fragrant scent of the jasmine flowers lingering in the air heralds the arrival of the autumn season. 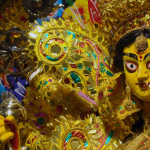 Most importantly, it is the arrival of Navaratri and Durga Puja festival. 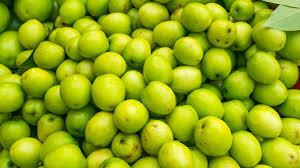 The first one is mainly celebrated in North India and the later one is celebrated in East India. 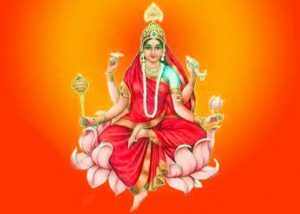 Both these festivals celebrate feminism and promote female empowerment and people chant different prayers of the Mother Goddess during this time.These two festivals are celebrated with much pomp and gaiety. 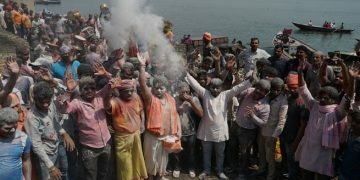 The celebrations are also a symbolism of victory of good over evil. 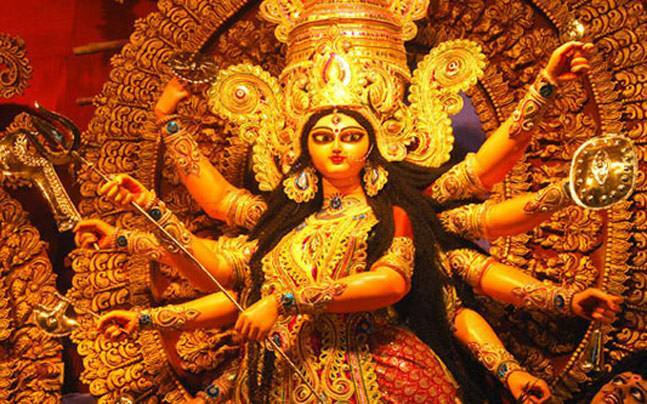 Navaratri and Durga Puja lasts for nine days and five days respectively. 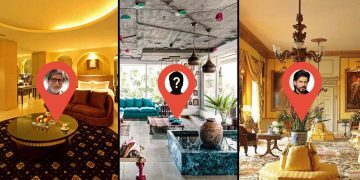 In these festivals, the sound of drums reverberate through the air and the aroma of sumptuous food lingers everywhere in the makeshift food stalls that sprung up in every nook and cranny. 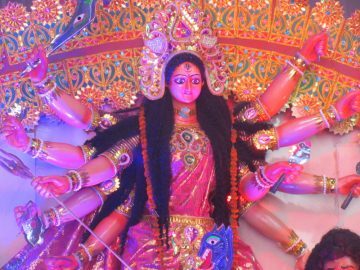 During Durga Puja, the five days are celebrated by worshipping Goddess Durga and in Navaratri, each of the nine forms of Goddess Durga are worshipped for nine days. 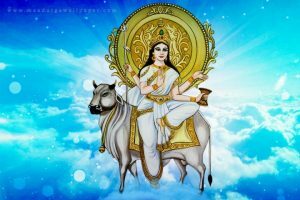 Shailputri is worshipped during the first day of Navaratri. Shailputri means the daughter of mountains, also called Shail. She is depicted as riding a bull who holds a trident in her hand and is considered to be the embodiment of three Gods– Brahma, Vishnu and Shiva. 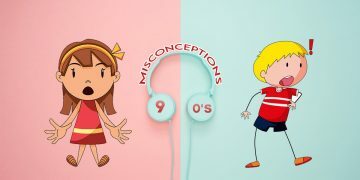 She signifies self-realization. In Hindu mythology, she is considered to undertake severe fasts and penances amid vast disturbances to attain Lord Shiva as her husband. 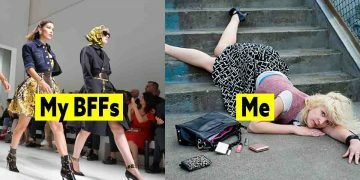 She portrays that hard work and pain is necessary to attain our goal and realizing ourselves what is best for us and working for it with sincerity and dedication can help us in achieving success. She represents the ability of a woman to persevere in spite of hardships. 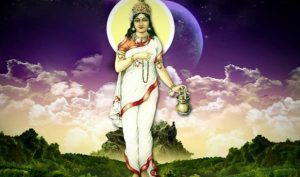 Brahmacharini is worshipped during the second day of Navaratri. She is depicted as wearing white clothes, holding rosary beads and a water pot. Her form embodies calm and peace. She teaches us that focus on our goal is the most important step of success as she meditated in full concentration for attaining Lord Shiva as her husband. She represents the ability of a woman to handle tasks patiently and calmly. Chandraghanta is worshipped during the third day of Navaratri. She is depicted as a ten-handed fierce goddess who wears a half-moon shaped like a bell. Her third eye always remains open and she rides a tiger or lion as her vehicle. Her form portrays the bravery of a woman. When she is insulted she can destroy her foes in a dangerous manner to fulfill her revenge. 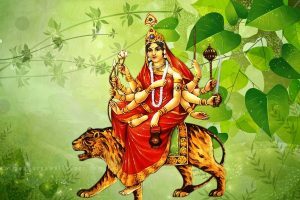 Kushmanda is worshipped during the fourth day of Navaratri. She is depicted as a eight-handed goddess who is responsible for creation of the universe and bringing light when everything was void and dark. She is credited with creating the three divine goddesses- Parvati, Lakshmi and Saraswati. She portrays the reproductive power of a woman. Her form signifies the ability of a woman to reproduce and create life in this world thereby taking the world forward. Skandmata is worshipped during the fifth day of Navaratri. She is depicted as a four- handed goddess who carries her son Lord Kartikeya in one of her hands. Her form signifies the glory of motherhood of a woman. In Hindu mythology, it is portrayed that Goddess Parvati brought up and trained Lord Skanda or Kartikeya to kill the demon Tarakasura. This form of the goddess signifies the qualities of a mother and her way of rearing her child with love and care. 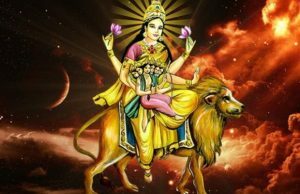 Katyayani is worshipped during the sixth day of Navaratri. 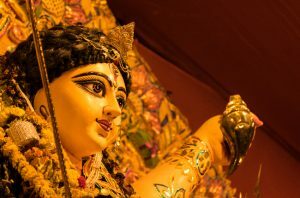 The form of this goddess is worshipped during the festival of Durga Puja in East India. She is depicted as a ten-handed fierce goddess who slayed Mahisasura, the buffalo demon. This form signifies the bravery and courage of a woman. 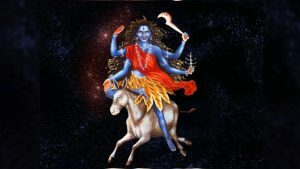 Kalratri, the most fearful form of Goddess Durga is worshipped during the seventh day of Navaratri. The dark-skinned goddess is well known for slaying Raktabeeja by devouring all his blood. Kalratri portrays the bold and daring personality of a woman apart from bravery and courage. 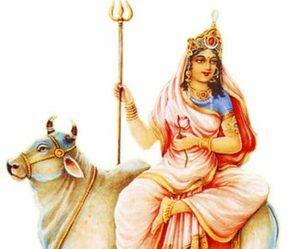 Mahagauri is worshipped during the eighth day of Navaratri. She is depicted as a brilliant goddess who wears white attire and is very beautiful. This form of the goddess signifies intelligence and beauty of a woman and is a chief form of depicting beauty with brains. Siddhidatri is worshipped during the ninth day of Navaratri. She is depicted as a four-handed goddess possessing eight supernatural powers. 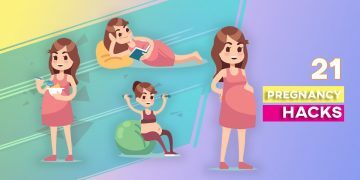 This form portrays the multiple talents of a woman and signifies the ability of a woman to handle multiple tasks efficiently. 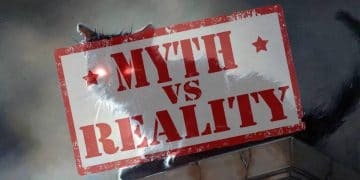 With so many forms of female power worshipped during the nine days of Navaratri, it is ironical that almost every Indian woman have something to say on the MeToo Movement taking the social media by storm.